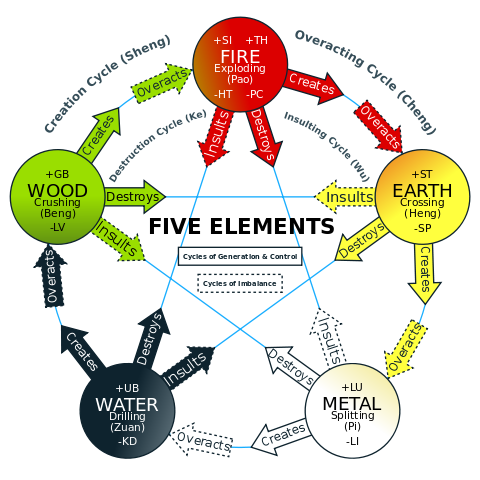 The consideration of the world under the viewpoint of five elements is a metaphysical view that can be found in many ancient cultures. Such an element scheme can be applied to most planes of creation. Even on the highest tarot card, the Parashakti is depicted with 4 surrounding beings within their respective divine elements, which are also described in the revelation of John. She is therefore the divine essence of these four divine beings. The indian Vedes connect the five elements (Pancha Bhoota, Panchamahābhuta) with gods such as Agni (fire), Vayu (air) and Varuna (water). According to the vedantic Panchikarana doctrine, matter emerged from the five primordial subtle elements. In Hinduism these are linked to certain chakras, and also to parts of the body and certain fingers . The Taittirīya Upaniṣad describes 5 envelopes of the Purusha that produce the 5 elements. 'From this atman came akasha (space); from akasha air; from air fire; from fire the water, from the waters the earth; from the earth the plants; from the plants the food; from the food the man ... '. In the Samkhya, the five elements (panchatattvas) belong to the Prakriti. This school, according to Kapila, sees the pancha tanmatras as the essential elements('the essence of') of the physical manifestation. The Shiva Samhita 1.3 teaches in 71 : The air streamed from the Akasa; the fire came from the air; from the fire water; and from the water came the earth. That is the order of subtle emanation. ". Within the Kashmiri Shivaism, the 5 Tanmatras correspond to the 5 elements. They are the substance from which the lower universe is created. Each Tanmatra is linked to a specific element, but it represents a more subtler aspect than, for example, the material elements in Taoism. According to Fr. 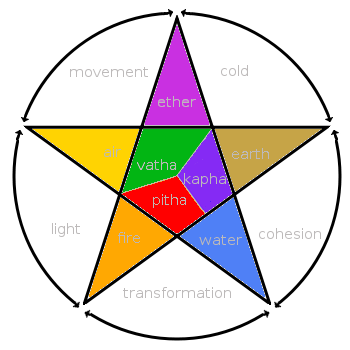 Bardon, the tantras of the five elements are named Mahabhuta (Pali: cattāro mahābhūtāni, jap. Goshiki). They are represented by the Bidju-formulas kha, ha, ra, va and a , which also serves as Vairocana mantra (a-va-ra-ha-kha). Sometimes space and consciousness are also added. The japanese Dainichi - Buddha is often portrayed with a gesture called the 'Mudra of the six elements' (Japanese Chiken-in), in which the Index-Finger of the left hand is enveloped by the five fingers of the right hand. This mudra is to symbolize the unity of the five secular elements (earth, water, air, fire and space) together with the sixth element of consciousness . The Nikayas distinguished between the mahabhutas as primary elements (rupa-dhamma) and the resulting secondary elements (upada-rupa). According to the Patthana, which belongs to the Pali canon, the four mahabhutas are the 'upada rupas' as the causative conditions (paccaya). The 'upada-dhammas' emanate the 'rupa-dhammas'. Some ancient Tibetan stupas also symbolize the 5 elements. A a fifth element is ākāsa - dhātu, but sometimes also the emptiness. Plato assignes in his Timaios a body to each of the four elements, as well as to the ether, and he illustrates the four elements in Tim. 49 bf as a cycle. Aristotle assigned the properties of warm / cold and dry / moist to the four elements, and characterized the ether as a quintessence and basis of the four elements. 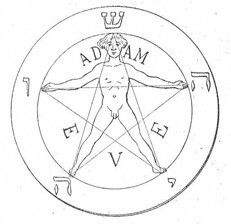 In alchemy, a process runs cyclic through the four elements, starting with the earth element, or throught cycles of the 7 planets, depending on the mode of observation. Various elements are assigned to certain substances. The philosopher's stone, from this point of view, signifies the dominion of the Quinta Essentia over the four elements. The occult magic symbolizes the 5 elements through the pentagram. Individual elements are assigned positive and negative properties, and the white magician must strenghten to eliminate the negative properties , thus preserving the magical balance.